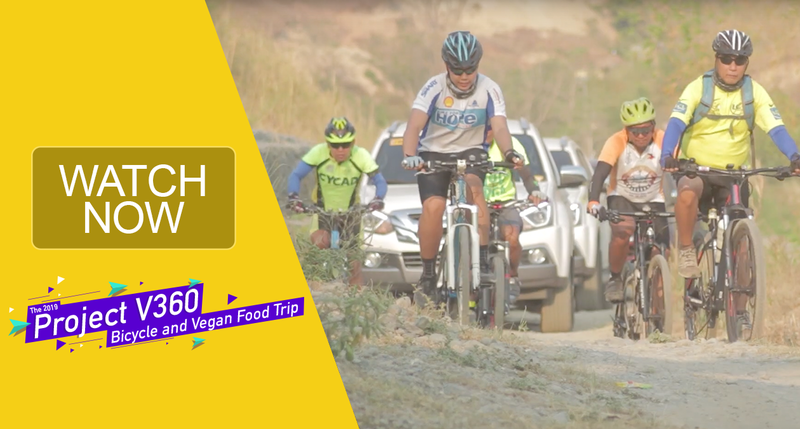 Meat-eating cyclists of Cycad (Cycling Adventures and Advocates) recently went on a 100% plant-based diet for five days while biking the most difficult mountain passes in the Philippines. On their fourth day, these cyclists pedal on for another 100 kms, from Bontoc, Mountain Province to Cervantes, Ilocos Sur. The “Project V360” has been envisioned to be a 5-day, 500-km adventure tour organized by the advocacy website TessDrive.com and Cycad, taking participants through the most daunting, historical, yet picturesque mountain passes in central and northern Luzon: Dalton Pass, Bessang Pass, and Tirad Pass. For the entirety of the tour, only a 100% plant-based diet would be served to all cyclists and support crews. Thus far, the vegan team of chefs from Greenery Kitchen has served vegan or meatless versions of Filipino food favorites such as menudo, sinigang, barbecue, adobo, pakbet and tocino, added with Quorn vegan fishless fingers with dairy- and egg-free soyanaise, and Quorn spicy vegan burgers. All vegetables, fruits and spices have been bought from local markets. The “Project V360: Bicycle and Vegan Food Tour” seeks to attain the following objectives: 1) Promote a healthy, active vegan lifestyle; 2) Dispel the myth that plant-based foods do not produce sufficient energy for athletic activities; 3) Prove that vegan foods can be as delicious, if not more delectable, as their meat-based counterparts; 4) Dispel the myth that plant-based foods are limited to salads and side dishes; 5) Promote the consumption of vegetables, fruits, and nuts in the Philippines, a country rich in soil nutrients conducive for abundant plant growth, yet its citizens consume the least amount among Asian countries; 6) Promote cycling as a fun, safe, cost-efficient and healthy means to tour the country and its many destinations, and also promote cycling as among the most environmentally sound ways to practice eco-tourism, and; 7) Accommodate vegan-curious tourists who would be adventurous enough to want to try a different cycling tour of the country. The project is also made possible with the support of Quorn Philippines, Isuzu Philippines Corp, and Honda Cars Philippines.